When Daniel was a child and his friends played Power Rangers, he was a true hero – and played a Putty for them to beat-up. We talk about the Where’s Wally? (or Where’s Waldo? in the US) animated series, and indulge in scandalous WallyWorld parentage rumours. Speaking of hard hitting, this episode of Power Rangers tackles the touchy subject of divorce. Unsurprisingly, that plotline gets railroaded by an armpit-gas-monster. What’s a ‘reverse-Justin’? It’s surprisingly G-rated. Is Tommy an orphan? We lay out our theory, just in time for his return! GO, GREEN RANGER GO GO to parent’s day at Angel Grove High… without any loved ones! Where’s Wally: The Animated Series ran for 13 episodes, and somehow never tackled the complex issue of Wenda’s parentage. There are 3 Where’s Wally fanfictions listed on Fanfiction.net. The Power Rangers Dino Charge cast has been announced. Austin St John is reportedly in talks with Saban to return for Dino Charge, and I for one would love to see it. The weirdest thing about the Where’s Waldo theme is that it sounded exactly the same in Australia, except they sang “Wally” instead of “Waldo”. 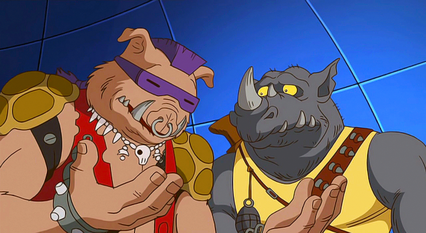 Bebop and Rocksteady are a not unfair approximation of Bulk’s parents.